What is Nucleophilic Aromatic Substitution and how does it differ from Electrophilic Aromatic Substitution? And why does it tend to work best with electron-poor aromatics and excellent nucleophiles? Finally, how does it work? This post tries to answer all of these important questions. Here’s a summary. Let’s review electrophilic aromatic substitution (EAS). What have we learned? Lewis acids can make electrophiles even more electron-poor (reactive), increasing the reaction rate. For example FeBr3 / Br2 allows bromination to occur at a useful rate on benzene, whereas Br2 by itself is slow). Everything we’ve learned so far about substitution on aromatic rings would teach us that it proceeds much faster with methoxybenzene than with nitrobenzene, and much faster with an electrophile like Cl2 than with, say, an electron-rich nucleophile like NaOCH3. Which brings us to the reaction below. The aromatic ring is electron-poor and we’re adding an electron-rich nucleophile. What could happen here? Nothing, right? “Nothing” is a good guess! Certainly, thinking of this as an electrophilic aromatic substitution, you’d be right in thinking that the answer to “what happens here?” is “jack squat”. In this substitution reaction the C-Cl bond breaks, and a C-O bond forms on the same carbon. 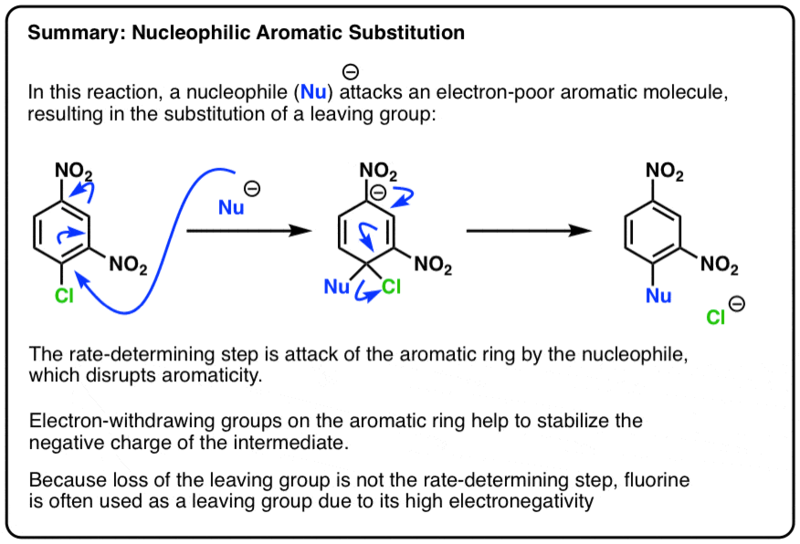 The position where the nucleophile attacks is determined by where the leaving group is, not by electronic and steric factors (i.e. no mix of ortho– and para- products as with electrophilic aromatic substitution). In short, the roles of the aromatic ring and attacking species are reversed! The attacking species (CH3O–) is the nucleophile, and the ring is the electrophile. Since the nucleophile is the attacking species, this type of reaction has come to be known as nucleophilic aromatic substitution. In nucleophilic aromatic substitution (NAS), all the trends you learned in electrophilic aromatic substitution operate, but in reverse. The first trend to understand is that electron withdrawing groups (EWG’s) dramatically increase the rate of reaction, not decrease it. From this, it follows that the more EWG’s there are, the faster the reaction. (I don’t have a rate constant for 2,4,6-trinitrophenyl chloride readily available, but it is orders of magnitude faster still). One of the most eye-opening aspects of nucleophilic aromatic substitution is noting that fluorine is often used as a leaving group. This is seen in Sanger’s reagent for sequencing peptides, to take one example (more on that below). After all, given the stern tones we instructors use in Org 1 on this subject, the words “FLUORINE IS NEVER A LEAVING GROUP IN SN2 AND SN1 REACTIONS” may as well have been carved on one of the stone tablets handed down to Moses on Mt. Sinai. Here’s a thought: if even a “bad” leaving group like fluorine works in nucleophilic aromatic substitution, then surely a “better” leaving group like bromine or iodine would work even better. Right? This is a good hunch. It is also wrong – which does not make it a dumb idea, only that organic chemistry is deep. For one reaction studied, F as the leaving group was observed to be 3300 times faster than iodine ! And between chlorine, bromine, and iodine, the difference was only by a factor of about 3. So what could be different about nucleophilic aromatic substitution that makes the rate of reaction much less sensitive to the identity of the leaving group than the SN1 and SN2 reactions? Well, for one thing, this would suggest that, unlike the SN1 and SN2 reactions, C-F bond cleavage does not occur in the rate-determining step. 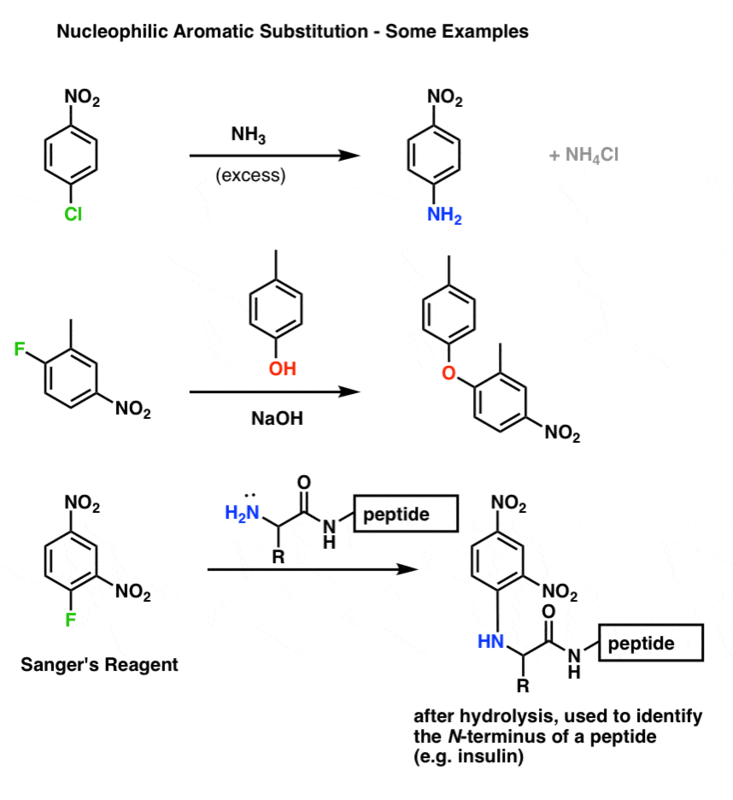 This information is helpful in coming up with a mechanism for the reaction. Unlike in electrophilic aromatic substitution, there are no “ortho-,para-” or “meta-” directors. The position of substitution is controlled by the placement of the leaving group. However that isn’t to say that the rate of the reaction isn’t affected by the relative position of the leaving group and the electron-withdrawing group. 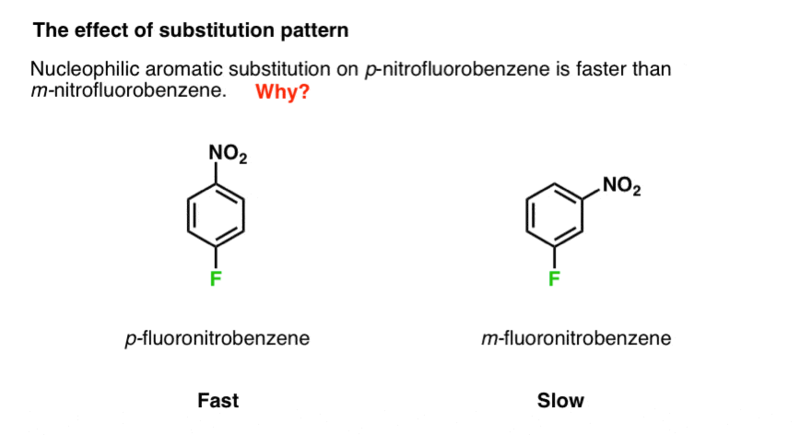 For example, nucleophilic aromatic substitution of p-nitrophenyl fluoride is orders of magnitude faster than m-nitrophenyl fluoride, even though the NO2 is closer to the leaving group and should presumably exert more of an inductive effect. The ortho isomer is also faster than the meta by a large margin. In the course of adding nucleophiles to various electron-poor aromatic molecules with a leaving group, intermediates have been isolated. One of the first was isolated in 1902 by Jacob Meisenheimer, and the general name “Meisenheimer complex” is given to these intermediates. 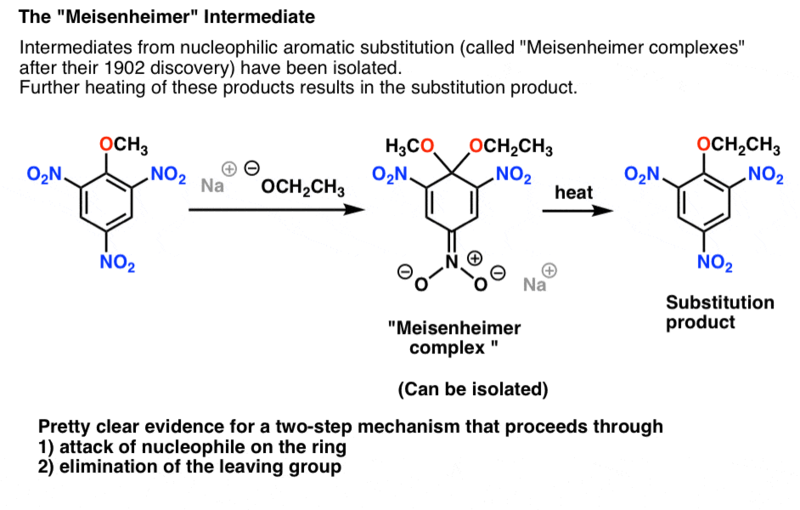 Meisenheimer intermediates can be isolated and characterized. However, if heated, the compound goes on to form the final nucleophilic aromatic substitution product. This is very suggestive, to say the least. Taking all of these observations into account we can now propose a mechanism for this reaction. In electrophilic aromatic substitution (EAS) we saw that electron-rich substituents stabilized the electron-poor intermediate. But in nucleophilic aromatic substitution (NAS) the tables are turned! Instead, the intermediate is electron-rich, and is stabilized by electron-withdrawing substituents, such as NO2. 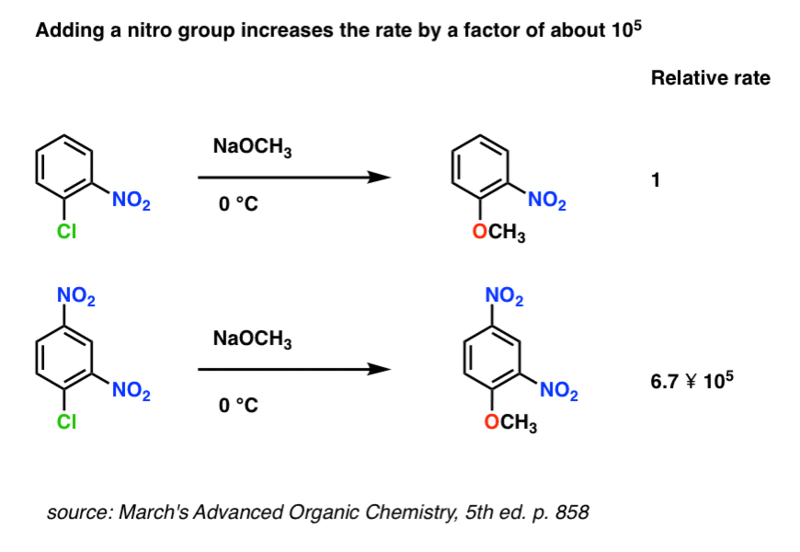 This two-step mechanism where addition is the rate-determining step helps to explain our earlier puzzle of why the reaction with para-nitro is faster than the meta- isomer. Note how the anion in the para- intermediate can be delocalized to the oxygen on the nitro group, putting a negative charge on (more electronegative) oxygen. In the meta- intermediate, the negative charge cannot be delocalized to the nitro group, and is stuck on (less electronegative) carbon. (This also explains why addition is fast for the ortho– isomer). 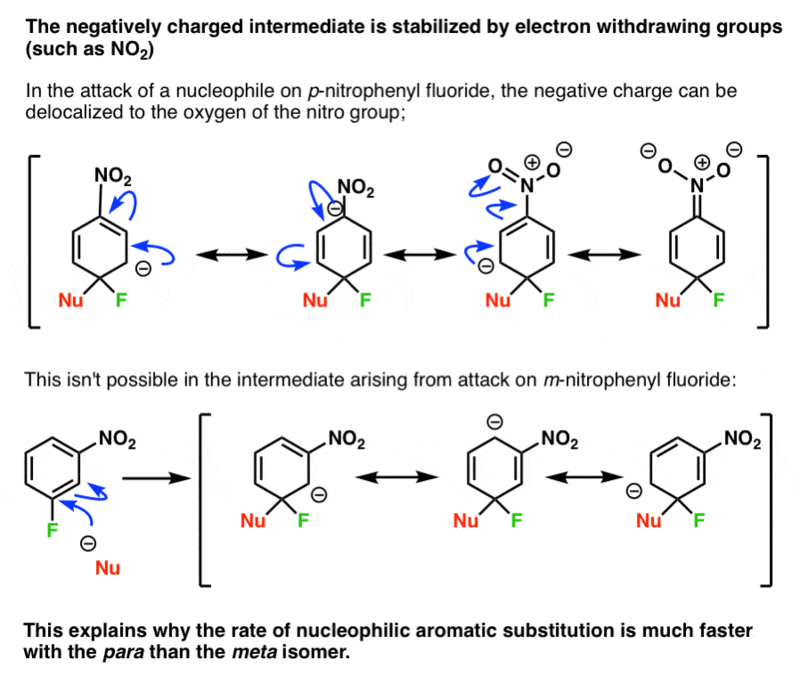 It also helps to explain why fluorine substituents increase the rate of nucleophilic aromatic substitution: the rate determining step is attack on the aromatic ring, not breaking the very strong C-F bond. The highly electronegative fluorine pulls electron density out of the ring, activating it towards attack. So even though breaking a C-F bond is generally not energetically favorable, this is compensated by the fact that it restores aromaticity. (remember: transitition states are “peaks”, and intermediates are “valleys”. Intermediates can (at least theoretically) be isolated; transition states have partial bonds, only last a femtosecond, and can’t be isolated). 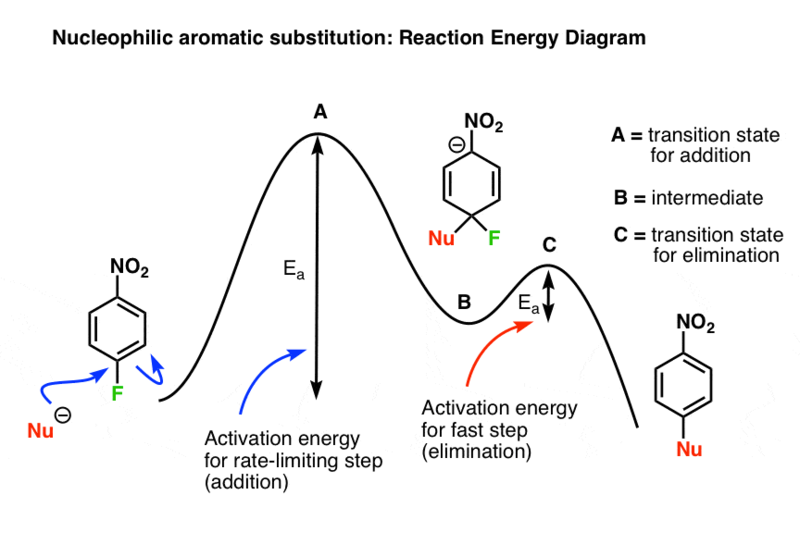 The nucleophile adds to the aromatic ring through transition state A (the rate limiting step) to give the negatively charged intermediate B, with a further input of energy (Ea) ascends to transition state C (loss of the leaving group, the fast step) and from there, the final product. The first is a straightforward nucleophilic aromatic substitution using an amine as a nucleophile. The third example shows the N-terminus of a peptide reacting with 2,4-dinitrophenyl fluoride in a nucleophilic aromatic substitution reaction. Fred Sanger used this reagent to label the terminal residues in insulin, which led (after a lot of detective work, detailed here) to the first reported sequence of a protein (and a Nobel Prize in chemistry in 1958). Well, now you’ve seen something we once said was impossible: fluorine as a leaving group. While we’re here, what other commandments from Org 1 can we possibly break? How about putting a triple bond on an aromatic ring? Yeah! In the next post, we’ll cover a reaction that also qualifies as “nucleophilic aromatic substitution” although it goes through a completely different mechanism, involving this “triple bond”, above. You probably already read this, and I think it’s inappropriate to ever teach in Sophomore organic, because it contains too many exceptions on top of exceptions, but…. Recent research suggests many substrates react via a concerted mechanism. The computational evidence had suggested it for a while, and experimental research recently caught up. A better leaving group like bromine, and a weaker electron withdrawing group, tends to favor a concerted mechanism. The “original” reaction with a fluoride leaving group, and multiple nitro groups, is still step-wise.